I just finished watching two trailers on Marvel, one for Planet Hulk (Marvel Animated movie premiering in Feb 2010) and the other one for Wolverine Anime trailer ("As part of a four-series collaboration between the Japanese Madhouse animation house and Marvel, Wolverine will star in a 12 episode Japanese anime that will premiere in spring 2010"). Both trailers look really cool, especially the Wolverine one. Synopsis: "He was once a normal fifteen-year-old-boy. He had a name, a family, a school, and a life -- and he thought he knew something. But that boy, and that time, and that life have become ... nothing. His whole mind seems to have been erased. There's no boy here anymore. No knowledge, no thought, no reason. Nothing but terror, endlessly repeating cycles of it, layer upon layer of it, in swirling sounds, images, and sensations. Now he only stares into nothingness and whispers two ominous words ..."
I thought the first book in the Veritas Project was good, but Nightmare Academy was so incredible that I could barely put it down. 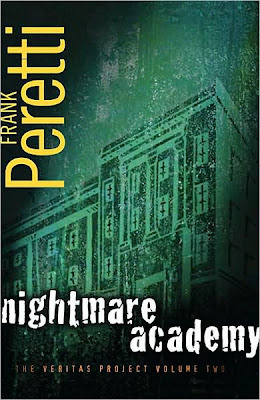 Nightmare Academy was by far the most terrifying school in the way that the "teachers" were slowly breaking down the kids’ views on right and wrong, and creating an environment in which there was no wrong or right way to do things. Along with the fact that there were no consequences for stealing, fighting, or raiding another students room. I honestly cannot do justice to Nightmare Academy in a simple review without giving away a crucial detail or twist to the story. All in all, Nightmare Academy earns 5 out of 5 pineapples. I am happy to say that today is the release date of the newest DC Animated movie Green Lantern: First Flight and I cannot wait till I get my own copy. Synopsis: "This fast-paced mystery suspense series features the Springfield family, an independent investigative team consisting of Nate, his wife Sarah, and their twin teenagers Elijah and Elisha. Veritas, the Latin word for "truth," has been selected to code name their effort "The Veritas Project. "Their mission is to investigate and solve strange mysteries, crimes, and occurrences, seeking not only the facts, but also the truth behind the facts. In Hangman's Curse, the family goes undercover in a small town high school where it appears that a mysterious curse is spreading throughout the school, attacking popular athletes and immobilizing the student body with fear. As the Springfields uncover the truth, they see first hand the devastating effects of peer-abuse." 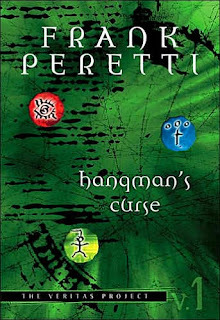 I found Hangman's Curse to be a fascinating read; it had plenty of action (which I love) and more than enough mysterious elements to keep my attention till the end. The only thing I didn't like about this book was a page or two near the end when they were wrapping up their case and the book took a sharp turn from thrilling to corny. Although I think it's a shame that there are actually people (children or adult) who treat others with no respect just because they are different or because they don't fall into the same group as the"popular" kids. The characters were fairly likable, ‘though I hate it when twins are given similar sounding names, like, Elijah and Elisha. If you aren’t a big fan of spiders I would suggest that you not read this book, because there are a lot of them in it, and I mean a lot! Hangman's Curse has earned 4 out of 5 pineapples. In My Mailbox was started by The Story Siren and inspired by Alea of Pop Culture Junkie. 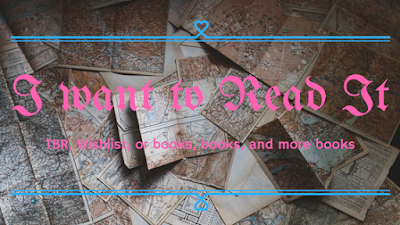 Sadly the only books I order are those that are hard to find. The following books are from the library and bookstores. Synopsis: "After being exposed as a girl, Jacky Faber is forced to leave the Dolphin and attend the elite Lawson Peabody School for Young Girls in Boston. But growing up on the streets of London and fighting pirates never prepared Jacky for her toughest battle yet: learning how to be a lady. Everything she does is wrong. Her embroidery is deplorable, her French is atrocious, and her table manners--disgusting! And whenever Jacky roams the city in search of adventure, trouble is never far behind. Then there's the small matter of her blue anchor tattoo. . . . So will Jacky ever become a typical lady? Not bloody well likely! But whether she's triumphing over her snobbish classmates, avenging a serving girl's murder, or winning over a stubborn horse that's as fast as the wind, one thing's for sure: Jacky's new life in Boston is just as exciting as her old one on the high seas." I'm so excited that my library had the second book in this series and I can't wait to read more about Jacky and her latest adventure. Synopsis: "The Veritas Project team has a new assignment: To find the truth behind the mysterious disappearance of two runaways. When one runaway turns up totally out of his mind, and a government agent steps in to take over the case, the Springfields continue their own investigation. The twins, Elijah and Elisha, go undercover, posing as runaways. What happens next will keep readers on the edges of their seats as the twins end up in a strange academy where Truth is challenged, a gang-like war develops, and Elijah is taken to an ominous mansion from which no one has ever returned. A great thriller with a realistic look at right and wrong." 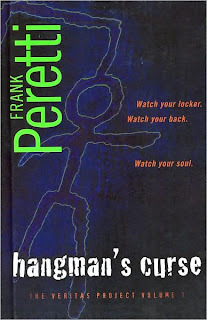 I just finished Hangman's Curse a couple of weeks ago and decided to get the next one while the library had it. Synopsis: "Rule #3: Don't stare at invisible faeries. Aislinn has always seen faeries. Powerful and dangerous, they walk hidden in mortal world. Aislinn fears their cruelty—especially if they learn of her Sight—and wishes she were as blind to their presence as other teens. Rule #2: Don't speak to invisible faeries. Now faeries are stalking her. One of them, Keenan, who is equal parts terrifying and alluring, is trying to talk to her, asking questions Aislinn is afraid to answer. Rule #1: Don't ever attract their attention. But it's too late. Keenan is the Summer King who has sought his queen for nine centuries. Without her, summer itself will perish. He is determined that Aislinn will become the Summer Queen at any cost—regardless of her plans or desires. Suddenly none of the rules that have kept Aislinn safe are working anymore, and everything is on the line: her freedom; her best friend, Seth; her life; everything. Faerie intrigue, mortal love, and the clash of ancient rules and modern expectations swirl together in Melissa Marr's stunning 21st century faery tale." 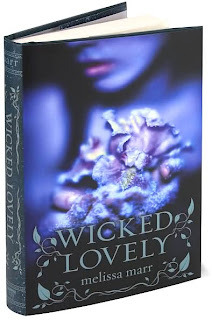 I've been meaning to get Wicked Lovely for a long time (like, since it came out) and now I finally have a chance toread *yay*. Synopsis: "Through the story of the brilliant but conflicted young Raskolnikov and the murder he commits, Fyodor Dostoevsky explores the theme of redemption through suffering. 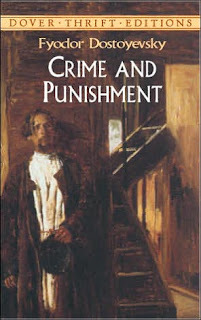 Crime and Punishment put Dostoevsky at the forefront of Russian writers when it appeared in 1866 and is now one of the most famous and influential novels in world literature. The poverty-stricken Raskolnikov, a talented student, devises a theory about extraordinary men being above the law, since in their brilliance they think “new thoughts” and so contribute to society. He then sets out to prove his theory by murdering a vile, cynical old pawnbroker and her sister. The act brings Raskolnikov into contact with his own buried conscience and with two characters — the deeply religious Sonia, who has endured great suffering, and Porfiry, the intelligent and discerning official who is charged with investigating the murder — both of whom compel Raskolnikov to feel the split in his nature. Dostoevsky provides readers with a suspenseful, penetrating psychological analysis that goes beyond the crime — which in the course of the novel demands drastic punishment — to reveal something about the human condition: The more we intellectualize, the more imprisoned we become." Well that's all for me in new books this week. This past week I got Coraline on DVD where I saw the trailer for the movie 9, and it looks awesome (I can't wait till it comes out). So without further nonsense I give you the trailer for 9. (I've decided to drop the Dame part of my name and just go by Orchid). 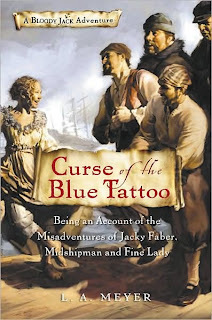 Synopsis: "Life as a ship's boy aboard HMS Dolphin is a dream come true for Jacky Faber. Gone are the days of scavenging for food and fighting for survival on the streets of eighteenth-century London. Instead, Jacky is becoming a skilled and respected sailor as the crew pursues pirates on the high seas. There's only one problem: Jacky is a girl. And she will have to use every bit of her spirit, wit, and courage to keep the crew from discovering her secret. 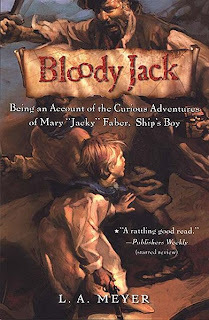 This could be the adventure of her life--if only she doesn't get caught. . . ."
Bloody Jack was simply amazing. The story, the characters, and the writing was fantastic. 'though I did find it a bit hard to believe that nobody (except the creepy guy who died) found out that she was actually a girl. The lengths to which she went to continue the "deception" were quite funny. I loved the awkwardness between Jaimy and Jacky, before and after he found out that she was a girl, so very funny. The Brotherhood was also fascinating with all their little rules and whatnot, and their shunning then acceptance of the truth. Saddest part(s) the deaths of some characters. Personnal favorite, I'm torn between when Jacky was strapped to a kite while looking for land and one of their first port calls (you just have to read it to find out). I’d definitely recommend Bloody Jack to everyone, it’s fast paced, exciting and just a fantastic read. Bloody Jack receives 5 out of 5 pineapples. Synopsis: "There's trouble on the Aching farm: monsters in the river, headless horsemen in the lane—and Tiffany Aching's little brother has been stolen by the Queen of Fairies. Getting him back will require all of Tiffany's strength and determination (as well as a sturdy skillet) and the help of the rowdy clan of fightin', stealin' tiny blue-skinned pictsies known as the Wee Free Men! Master storyteller and gifted comic Terry Pratchett is at his best in the adventures of Tiffany Aching and her tiny blue allies. Their first irresistible story comes to life in this lavishly illustrated edition, perfect for fans old and new." 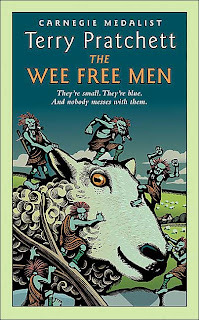 I am borrowing the Wee Free Men from 21, and so far it's really good. Synopsis: "Welcome to Nightshade, California—a small town full of secrets. It’s home to the psychic Giordano sisters, who have a way of getting mixed up in mysteries. During their investigations, they run across everything from pom-pom- shaking vampires to shape-shifting boyfriends to a clue-spewing jukebox. With their psychic powers and some sisterly support, they can crack any case! There’s a gorgeous new guy at Nightshade High: Duke Sherrad, a fortune-teller claiming to have descended from Gypsies. Even though she’s psychic herself, Daisy is skeptical of Duke’s powers. But when a teacher who was the subject of one of his predictions ends up dead, she begins to wonder if Duke is the real deal after all. Maybe if Daisy can track down the teacher’s killer, she can find out the truth. The only trouble is, all signs point to the murderer being of the furry persuasion. Is Daisy any match for a werewolf? Maybe she is . . . in more ways than she bargained for!" I'm borrowing this from Dahlia because the first one was awesome and I can't wait to read more about the Giordano sisters. Well that's it for me this week. 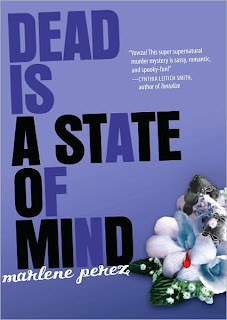 Synopsis: "Zoey Redbird is a teenage diva in every respect—well, almost. She doesn't get along with her mom and she hates her stepdad. That's normal. She adores her sweet grandmother. That's normal. What makes her different from the average teenage girl is that she is a vampire. In fact, two of her three boyfriends are vampires, her best friend is one of the ghoulish undead creatures that walk the streets at night preying on homeless people, and all of the students at the private boarding school she attends are fledgling vampires, including Zoey. Plus, Zoey is the president of the student body, if you consider being in charge of the Dark Daughters to be a leadership position. Filled with secrets, Zoey's life becomes harder and harder to handle as she tries to juggle what she has to do with what she is expected to do. Her main obstacle is the high priestess, who reigns over both the "vampyre" community and the boarding school. In this third book of the "House of Night" series, Zoey finds strength to challenge the priestess, who she believes is not what she appears to be. (But then, who is?)." While I really enjoyed the first two books in the series I was highly disappointed in Chosen. The main character's choices just really grated on my nerves along with her stupidity concerning the boys in her life. The only redeeming part of this book was the fact that they saved Stevie Rae from losing the last bit of her humanity and that Aphrodite proved that she was more than just a spoiled rich girl with parental issues. My least favorite part of the book was when Zoey fell for her teacher (Loren Blake) who was so blatantly playing with her and working for Neferet. I almost forgot how mad her friends made me; what with their anger over her keeping Stevie Rae's non dead status a secret when they know that it's near impossible to keep anything secret from the teachers there. Again the only good part of the book was that Stevie Rae was no longer a whatever she was. Although I must say that it was kind of a shocker what happened to Aphrodite in the end. 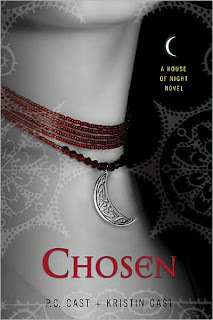 Would I read chosen again…NO, it was by far my least favorite book in the series so far. I would only recommend reading it if you are trying to get caught up on the series so that you will know what is going on. Since Chosen was a disappointment I am only giving it 1 out of 5 pineapples. I'm finally back from my (short) vacation, and boy was it fun. I spent a few days at the beach and got a nice golden tan and finished the three books that I took to read. 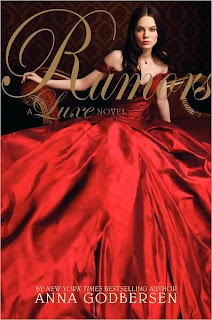 Since returning I've also finished Rumors (the second Luxe Novel) which I was in the middle of reading when I left (I didn't want to take it with me because it's a library book) and put a considerable dent in the Armies of Daylight. So until I get around to writing or finishing writing some of my reviews ya’ll are stuck watching this video by Emily West. Synopsis: "This fast-paced mystery suspense series features the Springfield family, an independent investigative team consisting of Nate, his wife Sarah, and their twin teenagers Elijah and Elisha. Veritas, the Latin word for truth, has been selected to code name their effort The Veritas Project, as their mission is to investigate and solve strange mysteries, crimes, and occurrences, seeking not only the facts, but also the truth behind the facts. In Hangman’s Curse, the family goes undercover at a small town high school where it appears that a mysterious curse is spreading throughout the school, attacking popular student athletes and immobilizing the student body with fear. As the Springfields uncover the truth, they see first hand the devastating effects of peer-abuse." Synopsis: "True love. False friends. Scandalous gossip. Welcome back to Manhattan, 1899. As rumors fly about the untimely demise of New York's brightest star, Elizabeth Holland, all eyes are on those closest to the dearly departed: her sister, Diana, the family's only hope for redemption; Henry Schoonmaker, the flame Elizabeth never extinguished; Penelope Hayes, poised to claim all that her best friend left behind; even Elizabeth's former maid, Lina Broud, who discovers that while money matters and breeding counts, gossip is the new currency. In this delicious sequel to the New York Times bestselling The Luxe, nothing is more dangerous than a scandal . . . or more precious than a secret." 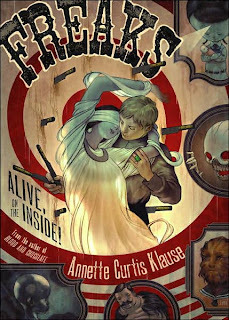 Title: Freaks: Alive on the Inside! Synopsis: "If this is a dream, why does she seem so real? Though Abel Dandy was born to circus performers and grew up in a troupe of odd and inexplicable people, he has never felt limited by his normalcy—until now. Realizing he'll never be more amazing than the talented oddities around him, Abel can only dream of living a life richer than his own. But in his dreams a mysterious woman beckons him, calling him passionately by a name he doesn't know and speaking in a language he's never heard, but fully understands. Compelled by these visions and yearning to be more than ordinary, Abel embarks on a journey more frightening and wondrous than he ever imagined...."
I have only read two books by Annette Curtis Klause and I loved them, so I decided to get this one when I saw it plus the covers really cool. Synopsis: "Jalil, April, David and Chris still haven't found Senna. They still haven't found their way out of Everworld. And — though they have managed to stay alive — things are starting to get worse. Because Jalil and the others are about to encounter one of the most powerful of Everworld inhabitants. He is called Merlin. 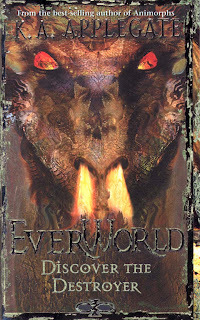 Merlin is the unseen force behind much of what happens in Everworld. And there is a good chance he knows where to find Senna. But he has his own agenda. And it doesn't necessarily include helping Jalil and the others. Now, they're about to discover what happens when you mess with Merlin..."
Synopsis: "Senna. The one and only reason David, Christopher, April, and Jalil are in Everworld. Senna is also the reason they can't get back to their own world. It seems she only shows up when she wants to be found. And she always disappears. At the moment, Senna is the least of their problems. Now they have to make a choice: Outsmart the dragon that killed Galahad - or die. And the odds of David and the others surviving by themselves aren't very good. But they've met some Everworld residents that might be willing to help for a price: Senna." Synopsis: "No one knows what it's like to be Christopher, David, April, Jalil, or even Senna. One minute they're off to Fairy Land to recover a dragon's stolen treasure. The next they find themselves sitting in the middle of history class. All it takes to move between the worlds is to fall asleep. And they just can't seem to find a way to make it stop. 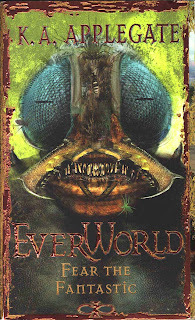 Now Christopher and the others find themselves at the single most powerful area in Everworld. Olympus. As in Greek gods. As in mythology. It seems that the evil alien god, Ka Anor, plans to take Olympus for himself — and Zeus isn't having any of it. Christopher and the others know it's not their fight. But they know ultimately they're going to have to choose a side. 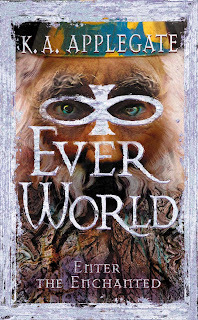 And it probably won't be Ka Anor's..."
I'm so excited that I found three of the books I am missing from the Everworld series. Especially since they are so hard to find and the fact that I want to know how the series ends..
Well that's all for me this week. P.S. I will be away from my blog for the next few days (like a week). Synopsis: "The Southerland family left the old world to start anew in America, but little did they know that a blood-feud, older than history itself, would follow them through the generations to come. Kate Southerland, the first born of the latest generation of Southerlands, has been murdered, but she is not dead. Her little brother, Johnny, has also vanished, a severed, bloody finger the only clue. But the Southerlands have no clue what they've fallen into. Their enemy is no mortal madman, but the undying mistress of evil enchantment, Morgan Le Fay, and the Southerlands are not her true target. She seeks to do battle with their protector, their defender, the only man who is capable of saving this mortal family from a war they've never realized was waged." I was a little over half done with An Old Friend of the Family when I found out that a couple of the pages were blank and I almost panicked. Because I was afraid I'd miss some vital part of the book, but luckily I didn't miss anything too important. An Old Friend of the Family was actually one of the better older (publication wise) vampire books I have read in a while. It was fairly fast paced and the story was really interesting, but it took a couple of chapters to really get going. I thought the whole storyline of Dracula being the protector of some old family to be a different twist. Which gave the story a little more depth. All in all, it’s definitely a worthwhile read for vampire lovers. I cannot think of anything else to say about the book, so I’m just going to end my review here. Rating, 3 out of 5 pineapples.